As you set foot in Craiva Veche, somewhere near Alba Iulia, the eye gets captivated immediately by the beauty of an almost deserted place, yet full of the warmest silence. As you walk the nature unfolds under your eye, rich in its mysticism and valuable through what us hides in the middle of the village: the blacksmith Emanuel Bezeriță. 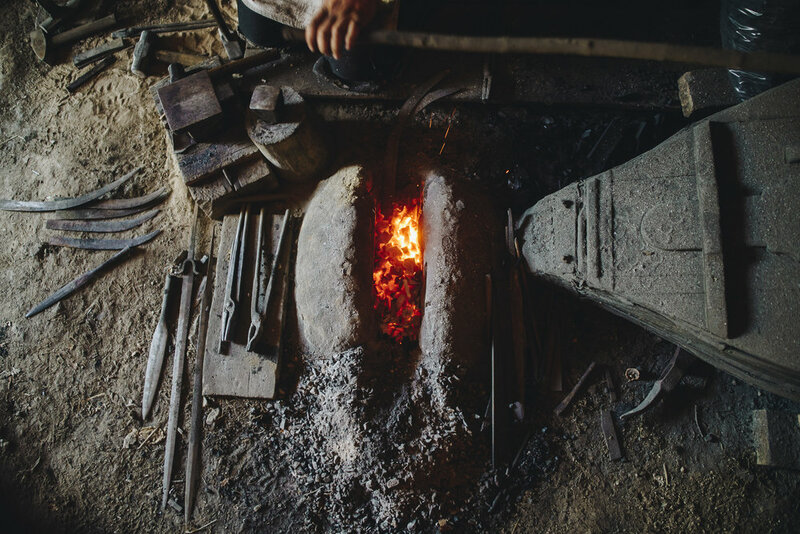 The blacksmith seems to be the last of its kind, but his story is peppered with revelations that only a life full of passion, challenges, and loss can push you to see. He greets us in his shop - his small Dacian oasis born out of the fire and the sound of the hammers that destroy before they create. Each experience shapes you, he tells us, just like the flames shape the iron before it is transformed into a Dacian work of art. In antiquity, the blacksmith was a god, demigod or priest. Emanuel is the "successor" who took birth from the love for craft and values - each Dacian weapon that sees the light out of his hands wears the imprint of his strong, hard-worked hands, but also of the fire that changes matter in what its destined to be. There is a special charm in working and transforming matter. You choose what you want it to become, you work, offer it a bit of trust and tradition, and it just rises tall, but sharp through the mysticism of time, just like the weapons from Dacian times. For Emanuel Bezerita, work and passion walk together on the same path without a drop of hesitation or distance between. And the things he crafts, last. They last through time, against a modern society that doesn't value durability. The blacksmith learned every object he made. Felt it, then worked it, and every new challenge brought with itself an object full of life, and full of worth. But what truly brought him reconciliation and happiness was his decision to abandon his city life and replace it with a new one full of meaning, in an apparently forgotten corner of the world. The city and his coffees are at the throw of a stick. Near, but far... it's how the silence sets in. In the days when he's not working on Dacian weapons that he sometimes can barely part, he revives Craiva Veche. House by house, fence by fence, giving it a new life, that he can afterward populate with people who just want to run away from the hastiness of modern times, who want to find again their thoughts and their passion. In the village, nature offers you everything you need to enjoy the passion of a craft, but also the inner silence needed for introspection that will help you discover yourself, again and again, refining the human essence of each. 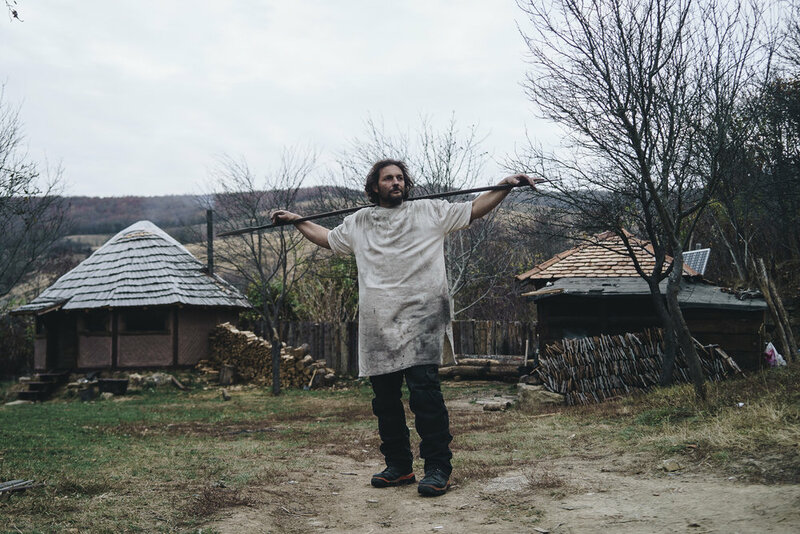 From the forge of the blacksmith starts the flame that turns the matter into reality, but also the one that guides his desire to give the abandoned village a new meaning inspired by the same mystical Dacian values. In the blacksmith's soul, the desire to transform the abandoned village into a small community of craftsmen with different passions and trades gives birth to the necessary dedication to not stop until this place is in harmony with people as passionate as he, from potters and ceramists to other craftsmanship. Among the sparks in the forge and his able movements, the blacksmith's life lessons are invaluable. They teach you how to find yourself, how to forget the everyday trivial for the old but rich values. Assuming yourself is the most valuable lesson for him and he does not mind translating it both in words and in the work he loves. As you work, you learn more about yourself than about the material. The profession is his life. And vice versa. The zodiac sign, the blood, and the call have chosen his job, just as his job has chosen him. As she talks about the hammers that accompany his work or the four elements that make it possible, his eyes sparkle of passion as if just taken out of the forge that makes the fire malleable. No matter how you learn a master craft, everyday toil and passion transform any challenge, such as a spear or a Dacian backward-edged weapon, into an unstoppable reality, just like iron. In Craiva Veche, peace is taking its breath from nature, from the green of the leaves, from the quietness of the place, from a mysticism that remained a legacy from the Dacian times or from when the village was inhabited, but every sound of the hammer fills it with life. Here, time expands, but in the cities, it compresses and flashes through fingers with everyday activities that draw attention from what really matters. And when they offer yourself you the cleanest version of yourself, the craft becomes a living legend. *If you want to see more of Emanuel Bezeriță’s work you can visit his Facebook page, KOMAKIZA.